RBTH presents a selection of views from leading Russian media on international events, featuring reports on the meeting between U.S. President Barack Obama and German Chancellor Angela in Washington and the preparation for the upcoming talks on Ukraine in Minsk, as well as analysis of the motives behind Russian President Vladimir Putin's visit to Egypt. The Kommersant business daily reports on U.S. President Barack Obama’s meeting with German Chancellor Angela Merkel in Washington on Feb. 9. In the course of the meeting, the two leaders developed a single position ahead of four-way talks between Russia, Ukraine, France and Germany in Minsk. The U.S. and Germany have made it perfectly clear that if the talks in the Belarusian capital on Feb. 11 do not yield tangible results, the West will toughen its approach to Russia. 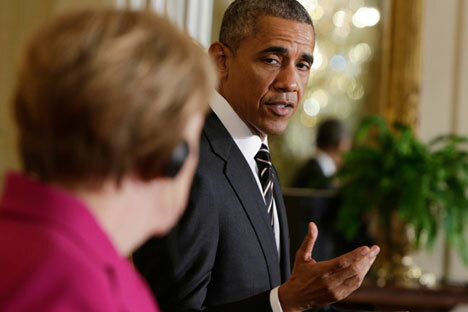 Obama has backed Germany's stance on the most important issues, Kommersant writes. However, for now Washington has chosen to "neither threaten Moscow with new sanctions, nor scare it with prospects of supplying Ukraine with American weapons." At the same time, Obama and Merkel did not say anything about the possibility of relaxing sanctions against Russia if the Minsk talks prove successful. The U.S. president promised to provide, along with the International Monetary Fund and other partners, the necessary financial support to Ukraine, describing the successful development of the Ukrainian economy as one of the most important objectives at present, Kommersant reports. Obama and Merkel both expressed one and the same thought at the meeting; the events in Ukraine and Russia's "aggressive policy" have strengthened the transatlantic unity between the United States and the European Union, Kommersant reports. The Expert weekly business magazine also followsthe preparation for the meeting in Minsk, reporting on the talks being held in Berlin between representatives of the foreign ministries of Russia, Germany, France and Ukraine. "The importance and complexity of the meeting cannot be overestimated," Expert writes, stressing that officials will have to find a solution that satisfies Moscow and Kiev, as well as provide guarantees for all parties to their commitments. Final agreement of the details is most likely to continue until the meeting in Minsk, Expert points out. According to the publication, the issue of federalization is one of the key points of dispute. Petro Poroshenko has tentatively agreed to a national referendum, Expert writes, suggesting, however, that a failure of the referendum will lead to a resurgence of violence as early as spring. For this reason, control of the border between the self-proclaimed republics in eastern Ukraine and Russia is a key issue. Kiev is demanding that Ukrainian border guards be returned to their posts, while pro-Russian rebels, with the support of Moscow, predictably object, Expert writes. Moreover, the EU will not remove the sanctions earlier imposed against Russia, even if Moscow offers a compromise; Europe has already proved this by introducing new restrictions against Russia after the signing of the Minsk Protocol last fall, the publication concludes. The centrist Nezavisimaya Gazeta dailyreports on the visit of Russian President Vladimir Putin to Egypt. President Abdel Fattah al-Sisi has been heavily criticized by Washington for the suppression of protests, which has brought tension and uncertainty to U.S.-Egyptian relations, the newspaper writes. But Russia has excluded the ideological element from its policy toward Egypt, which has allowed it to become a key supporter of Cairo outside the Arab world, Nezavisimaya Gazeta writes. In comments made to the newspaper, the director of the Center for the Partnership of Civilizations at the Moscow State Institute of International Relations (MGIMO), Veniamin Popov, noted that the U.S. is reorienting its strategy toward the Asia-Pacific region. "Against this background, the strengthening of Russian-Egyptian relations may have a stabilizing influence in the Middle East," he said. According to Nezavisimaya Gazeta, the main objective of Putin's two-day visit to Egypt was Moscow's intention to show the world that Russia was not at all isolated as the result of sanctions by the U.S. and the EU. Cooperation in the economic sphere is also a priority of bilateral relations: In 2014 alone the volume of trade between Russia and Egypt increased by almost half. In addition, due to the devaluation of the ruble, the countries are discussing the possibility of switching to settlements in national currencies, thus bypassing the U.S. dollar.